The work of Etienne Delaune creates a vivid portrait of a cosmopolitan artist who worked on a number of different subjects in various styles, and whose career was marked by both success and insecurity. Probably born in 1518, Delaune worked as a goldsmith in Paris in the 1550s. In 1552 he was appointed to the royal mint, where he would have produced metalwork designs. However, this post was cut short over disputes about wages: Delaune only held the post for six months. Etienne Delaune, Plate 3 from a suite of 12 entitled Seconde Suite des Mois de l’Année. French, 1568. This design showing the month of March was adapted and engraved on the drum clock pictured below by Félix Loubet. Delaune’s designs for some other months are also found, in modified form, on the drum clock. 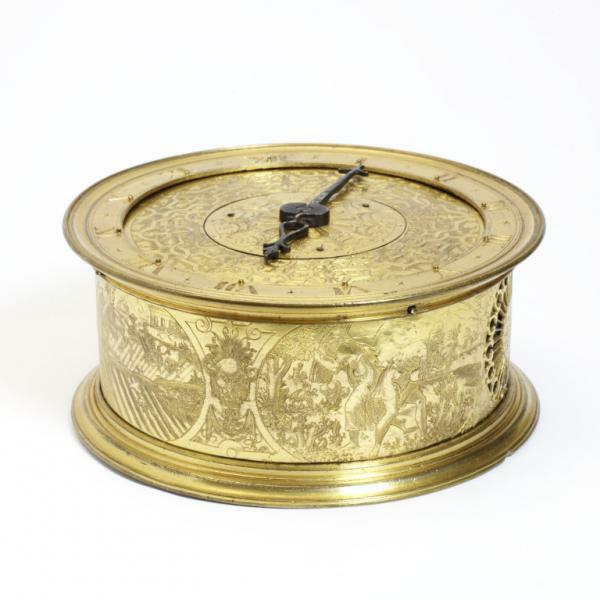 Drum clock with alarm engraved with scenes representing the months, after designs by Etienne Delaune. French, 1560-1580. Mouvement by Félix Loubet. The scene on the right shows March; that on the left, September. Despite the brevity of this position, Delaune had valuable family links with the French court and king. This allowed him to obtain commissions for designing intricately detailed royal armour, medals and other metalwork. 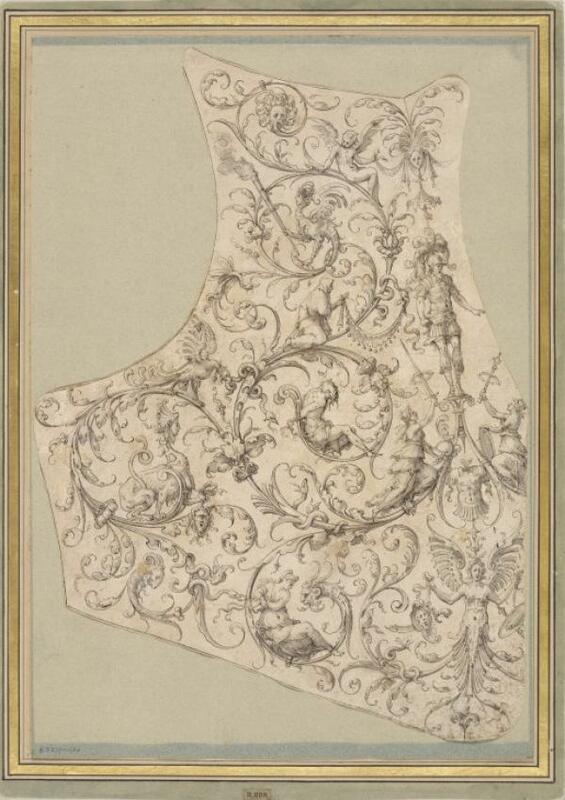 Etienne Delaune, design for a breastplate. French, 1556-1559. Pen, ink and wash on paper. This is a design for a breastplate for King Henri II of France. Its complex details can be seen reproduced in the finished armour, now at The Metropolitan Museum of Art, New York. 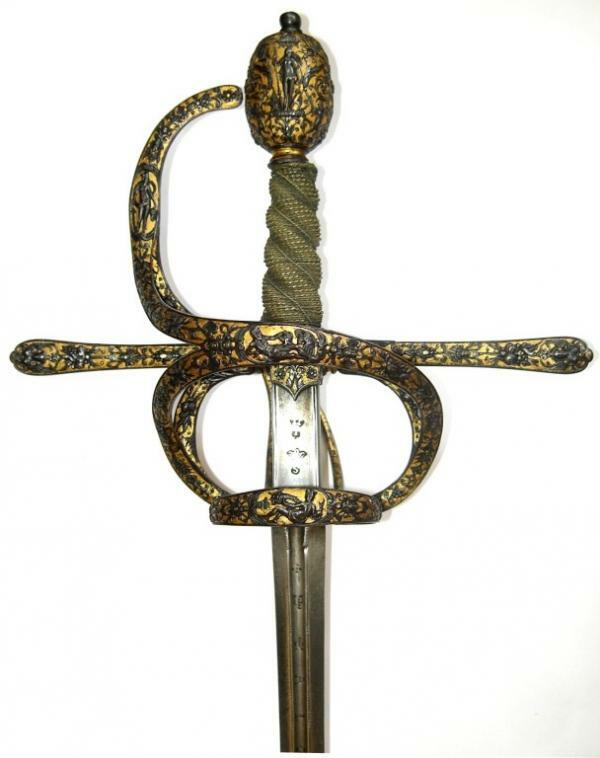 Sword with a chiselled steel hilt, blued against a gilt ground, by Daniel or Emanuel Sadeler, Prague or Munich, the blade signed ‘Alonso Perez en Toledo’, 1600-20. (Sword) Steel, chiselled, blued and gilt. The chiselling of the hilt is based on designs by Delaune. However, Delaune never held any “official” posts other than his period at the royal mint in 1552. Although he made numerous works for kings and important members of the court, including many engravings relating to Henri II, he was never the king’s goldsmith or armourer. His being a Protestant in a predominantly Catholic country may have accounted for his discreet role in court life. Etienne Delaune, print entitled Henricus II Galliarum Rex. French, mid-sixteenth century. 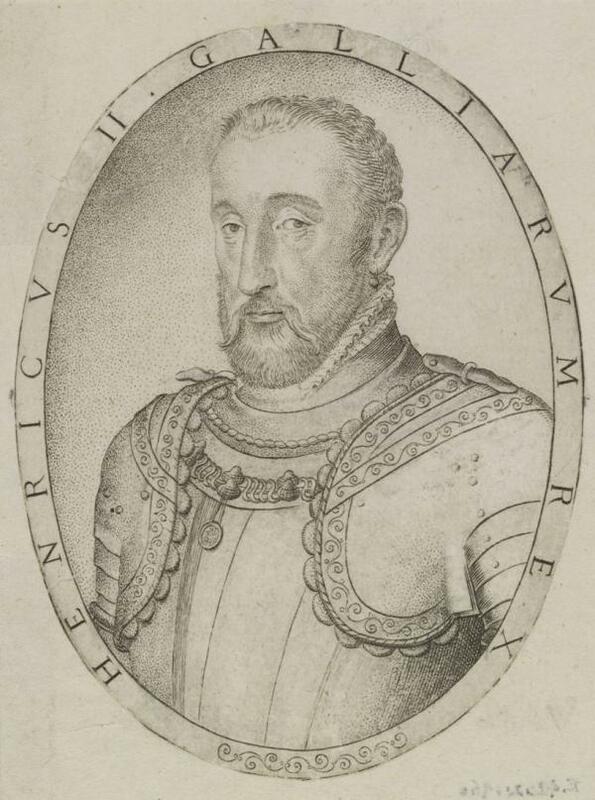 As well as engraving allegories of King Henri II of France, Delaune also produced portraits of him, such as this one. Indeed, Protestants were victims of persecution in the bloody St Bartholomew’s Day Massacre of August 1572, and Delaune had to flee Paris for the refuge of Strasbourg. Etienne Delaune, 1 of 10 plates from a suite of 12 entitled Sujets Mythologiques. French, 1573. This print was made in 1573 shortly after Delaune’s arrival in Strasbourg. It depicts Hercules hunting the Erymanthian Boar. Delaune seems to have stayed in Strasbourg and Germany during the 1570s. His engravings made here show that, whilst retaining some French and Italian influences, he was adapting to a more Germanic style. Certainly, Delaune already knew the works of German masters before he resettled. 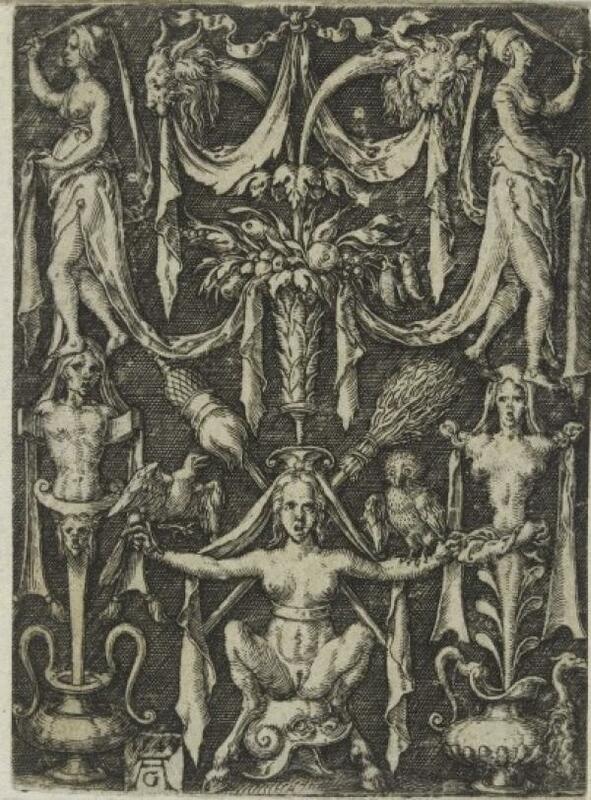 Etienne Delaune, 1 of 4 plates, including title-plate, from a suite of 8 entitled Grotesques à fond noir en forme de poire. French, 1573. This print shows David holding the head of Goliath. The fond noir, or dark background, of this print was much more typical of German than French engravings. 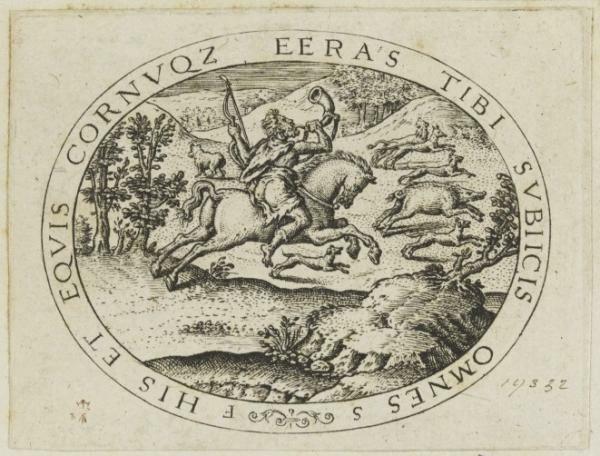 See, for example, the print below by Heinrich Aldegrever. 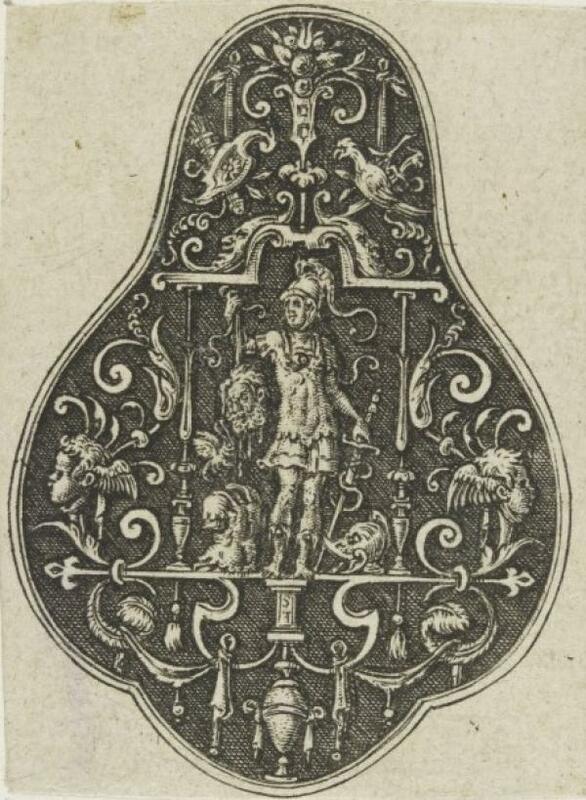 Heinrich Aldegrever, ornamental design with a female satyr seated on a helmet below. German, 1549. Delaune’s use of the fond noir background may well have been inspired by German prints such as this one. 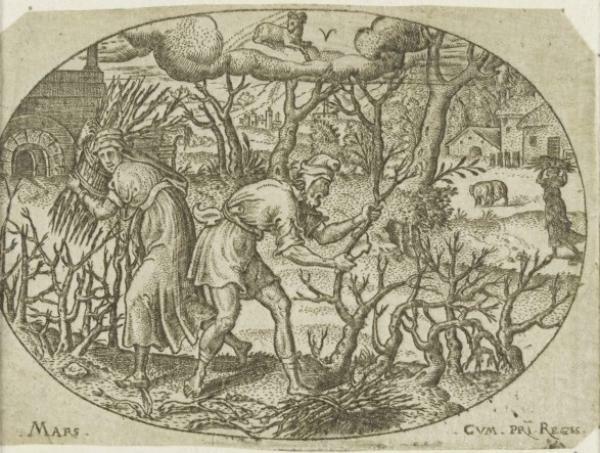 Between 1578 and 1580 Delaune’s engravings also mention his son Jean as the ‘inventor’ of compositions which were then engraved by Etienne. Delaune returned to Paris at the end of his life, where he died in 1583. Etienne Delaune, Plate 6 from a suite of 20 entitled Emblèmes Moraux, after a design by his son Jean Delaune. French, 1580. 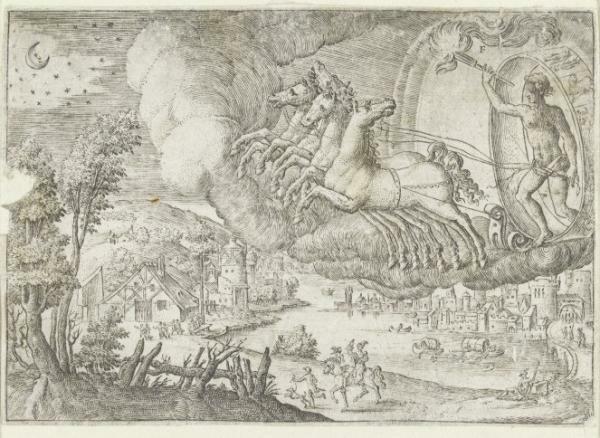 This beautiful print of Apollo’s sun chariot is an example of a design by Jean Delaune engraved by Etienne.